Nw wd u jst luk at tht! 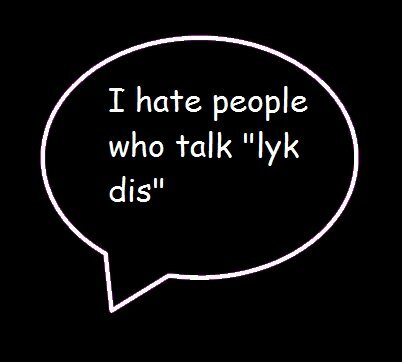 Don’t you just hate it when people start talking ‘lyk dis’? I for one find it really tiresome trying to decipher the meaning of what the person is actually trying to convey in a jumble of words that aren’t actually words. Whether it be an sms, a Facebook wall post or MSN or Facebook status message, it just raises my hackles when I see messages worded in such a manner. I can imagine for instance if a person is pressed short for time and the only way he can convey an urgent message is to type in as fast as possible and press the Send button. But then just doing it cause its the latest fad is somehow ripping apart the beautiful language that English is. I guess there are various reasons why people especially the youngsters tend to massacre the English language in this fashion. One reason of course being that everyone else in their peer group does it, so who would want to be left out and be the only one who is good enough in the language to make coherent sense when a sentence is put together eh? And I guess there are others who do it cause they might not have a proper command of the language and the only way English makes sense to them is to slaughter the words into pieces so that no individual who has a thorough grasp of the language would be able to make sense out of a string of nonsense! I recently found this group on Facebook that has around 211,805 fans approximately, who hate it when people tend to talk, text or email or Facebook in the way discussed. I guess seeing that I am not the only one who gets annoyed when people do not make much of a sense in garbled bunch of words stringed together made me write this post more than anything else! Correct!and agree! i think its the peer pressure that plays a vital role in this. one of those things eh! Yup, definitely a lot of people I know do it cos of peer pressure..